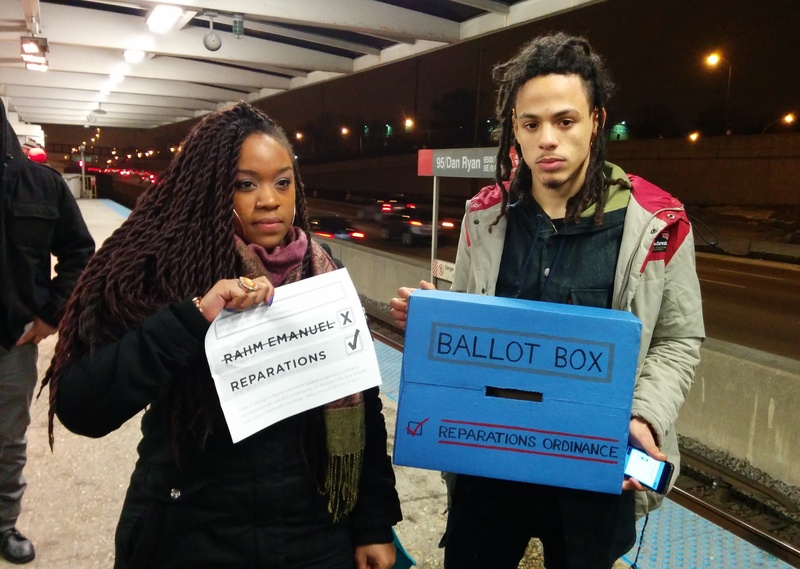 Supporters of Chicago’s proposed Burge Torture Reparations Ordinance scored a huge victory yesterday when Ed Burke, the Chairman of Chicago’s Finance Committee, announced the committee would grant the ordinance a hearing on April 14, 2015. 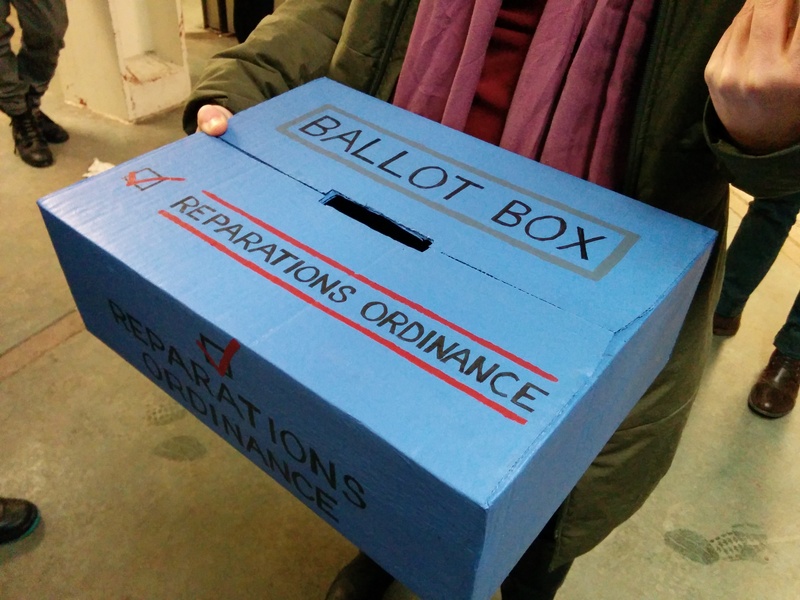 Over the past few months, activists, community members, and torture survivors have ramped up their campaign to pass the ordinance, emphasizing the demand that the measure be given a finance hearing. The ordinance has been stalled in the Finance Committee since it was filed in City Council on October 16, 2013, despite having the support of the majority of the City Council. Over the last three months, multiple organizations, including Amnesty International, BYP 100, The Chicago Light Brigade, Chicago Torture Justice Memorials, Project NIA and We Charge Genocide have held rallies, demonstrations, and marches to demand a public hearing on the ordinance. 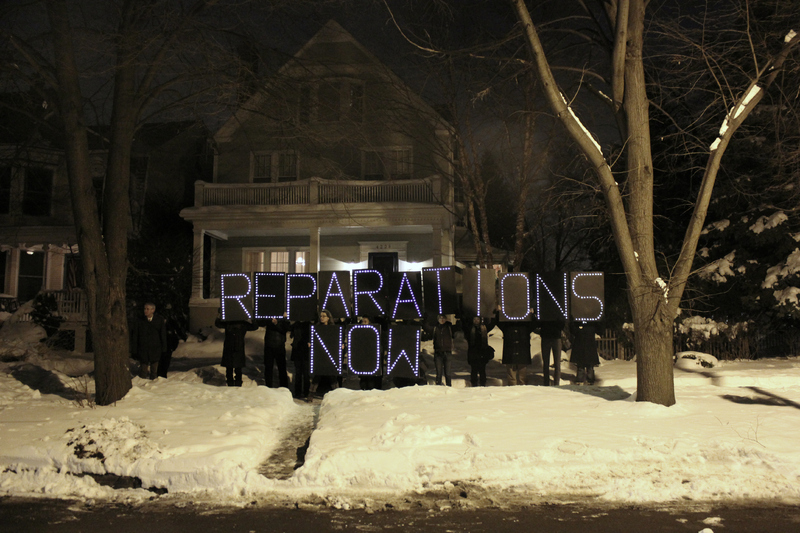 One such protest involved protestors paying a visit to Rahm Emanuel’s house, carrying a message in lights demanding passage of the ordinance. Another involved an action on the city’s Red Line, in which participants held performances, gave speeches, and connected with passengers about the ordinance on the eve of the recent mayoral election. During that action, and others, Rahm Emanuel was specifically called out for his failure to support the ordinance, but organizers have also continually expressed that all city leaders must be held accountable. The Ordinance would serve as a formal apology to the survivors; create a Commission to administer financial compensation to the survivors; create a medical, psychological, and vocational center on the south side of Chicago; provide free enrollment in City Colleges to the survivors; require Chicago Public schools to teach a history lesson about the cases; require the City to fund public memorials about the cases; and set aside $20 million to finance all of this redress – approximately the same amount of money the City has spent to defend Burge, other detectives and former Mayor Richard M. Daley in the Chicago Police torture cases. On a personal note, I want to remind everyone who is as excited about this news as I am that this fight is far from over. Efforts to pass the ordinance may require continued escalation. Those of us who have joined this fight in recent months are exceedingly grateful to everyone who has lifted up this cause over the years, allowing this potentially transformative moment to take shape. I’m also more grateful than I can say for the efforts of everyone who has stepped up and thrown down to ensure that some measure of justice is done here. The cycle of violence and brutality must be broken, and this ordinance is a very important step. Overall, this fight has reminded me just how powerful we are when our communities come together in common cause. I am heartened and strengthened by the courage and dedication of everyone I have been building and planning with, and by the unwavering love this community has shown in the face of police violence. Many of us have suffered at the hands of police, to varying degrees, and the fight waged by these survivors has reinforced to us all that police violence cannot break us, because love is always stronger than hate. We hope to see you tomorrow at City Hall, where we will be staging a pop up art exhibit about police torture, and resistance efforts, outside the mayor’s office. The exhibit begins at noon. At 4pm, we will rally in that space, celebrate how far we’ve come, and push forward with our demands. We will need each other in the coming weeks. Because now, more than ever, victory is in sight. Let’s get there together.